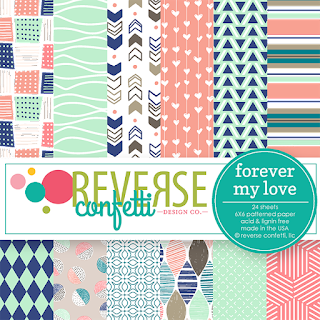 I'm so excited to share my first post as a guest designer (aka 'Fetti Friend) for Reverse Confetti's January release! 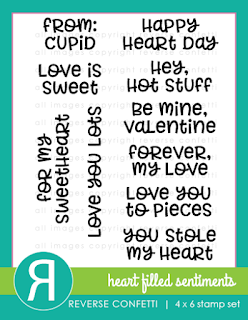 It's Day One of the Countdown to Confetti and we are ringing in the new year with sneak peeks of two fun and fabulous stamp sets: Heart Filled Sentiments and Congratulations (this set also has coordinating Confetti Cuts)! *Please note that new product links will not be active until release day/time. 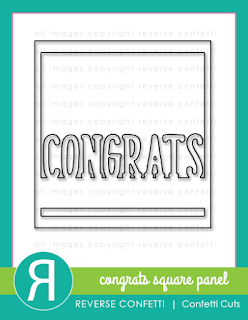 Congratulations stamp set and matching Confetti Cuts along with the new Congrats Square Panel Confetti Cuts die. And yes...there's a great new patterned paper 6x6 pad that will be a 'must have' on your wish list: Forever My Love! Aren't those yummy colors together?! Speaking of colors...did you see the new color chart that Jen posted on the Reverse Confetti blog on Tuesday? 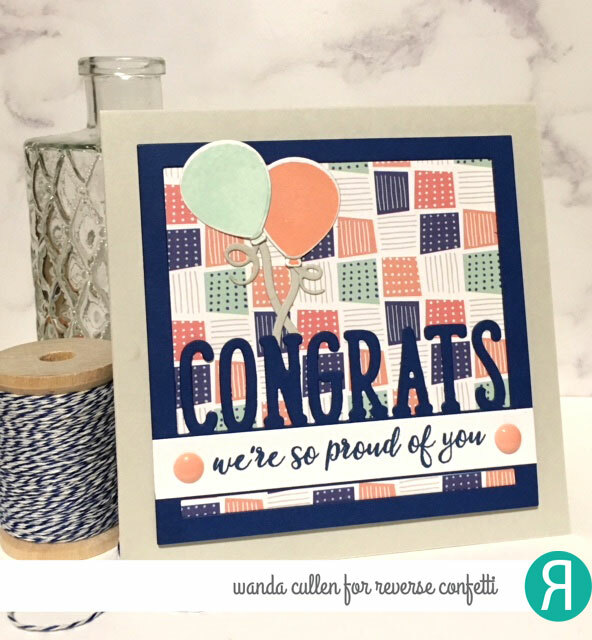 Her chart shows you all of the gorgeous RC ink colors in one graphic and the asterisks indicate which colors have matching cardstock! I'll have to admit I couldn't wait to get all of the colors and the little ink cube options make it so affordable! Getting back to my card project...I took the confetti die and cut it into sections to create little "curls" on the balloon strings. 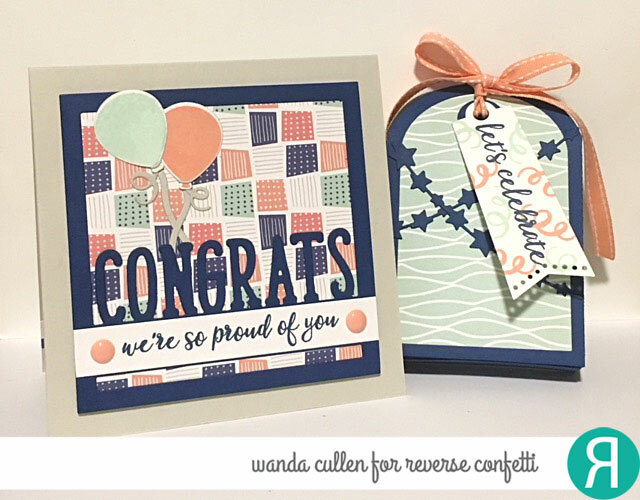 The Stone cardstock is one of my fave neutrals for card bases and pairs up so well with the Navy Blue frame! 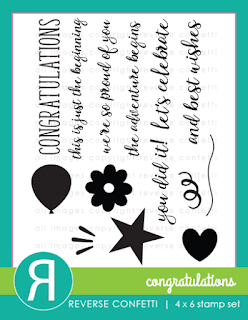 We will be giving away a $15 gift certificate to one blog commenter and also to one Facebook commenter, so be sure to leave a comment on each sneak peek post for each designer. Comments will close at noon CST on JAN 7th and the winner will be announced at 5pm on JAN 7th on the RC blog and FB page. Totes adorable (pun intended). :) I love the accompanying tote you made. The colors you used for your card complement each other beautifully. Congrats on being a 'Fetti Friend! Sweet projects Wanda! I love how you put it all together and you showcase the papers beautifully. Can't wait for the rest of the week. 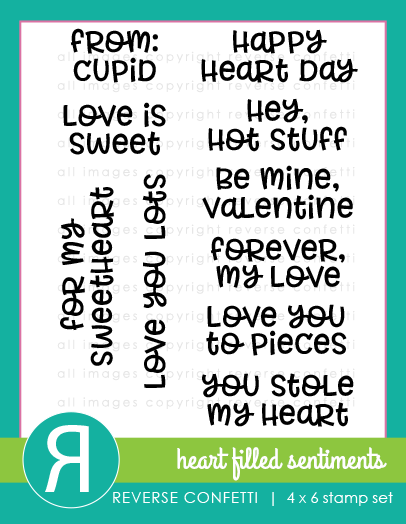 Oh LOVE that little gift tote tag, such a great idea! The patterned paper you chose is perfect for the first card, like rows and rows of little packages :)! 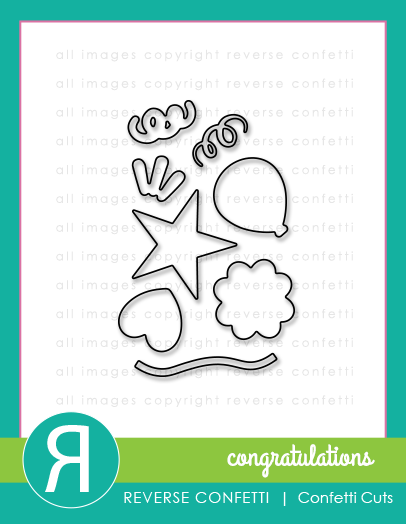 This happy congrats card is amazing! Love the color palette too! Wanda, these are simply FABulous!!!! We are so happy to have you designing with us! What a sweet ensemble! Love the little treat tote. Great projects! Love the colors! 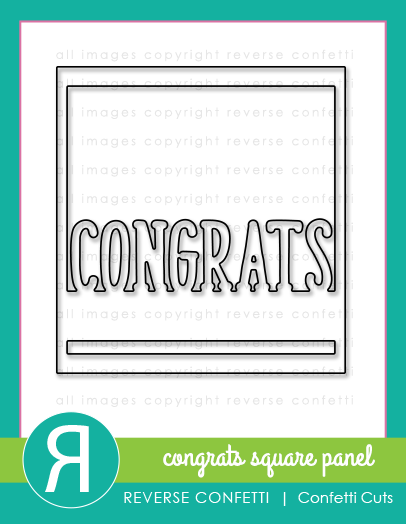 Wanda, a great gift set......love the RC papers used and especially the Congrats plate! These are lovely creations ! Another great release. Very cool. 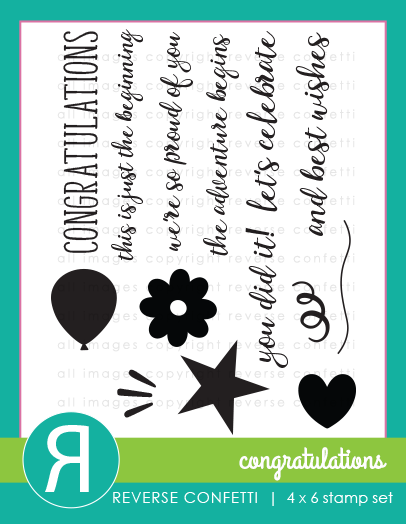 I love the congrats die, so versatile for weddings, anniversaries, graduation, and more. And love the colors and pattern you used. And that tag tote is so cute. Great ideas. Love the new stamp sets, dies, and patterns are so fun. Happy New Year! Wanda - I love your card and your tote! So adorable! I like your choice of papers with this cute duo. These projects are lovely. The tote is a special surprise; so cute!! so excited to see you guest designing for reverse confetti!! your projects are fabulous!! Your card and matching box are very cute. Great new dies and paper. 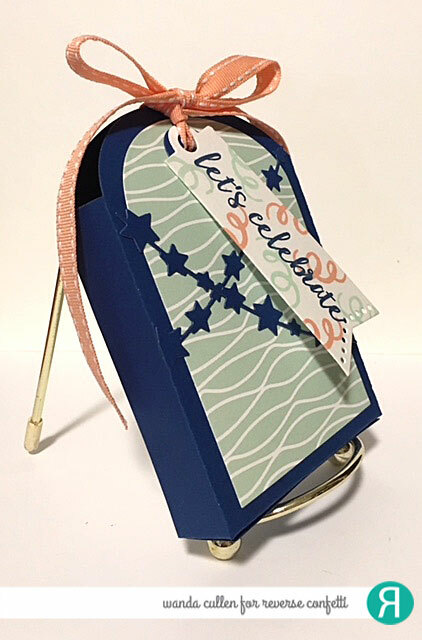 Great use of the pattern paper to make this wonderful card and matching tag. Adorable projects! Love how you used the new papers and dies! Lovely projects, great color choices. Great creations! I love that patterned paper....gotta have it! very pretty! love that die!